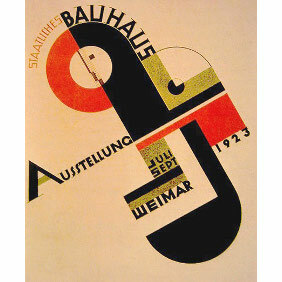 Founded in Germany in 1919 by Walter Gropius the Bauhaus school brought together artists, architects, and designers in an extraordinary conversation about the nature of art in the age of technology. This was a school of Architecture and Applied Arts, its disciplined style based on the fundamental geometric shapes of the cube, the rectangle and the circle. The revolutionary Bahaus teaching method replaced the traditional pupil-teacher relationship with the idea of a community of artists working together. Despite being shut down by the Nazis in 1933, Bahaus lived on with other schools starting in the US and Budapest. 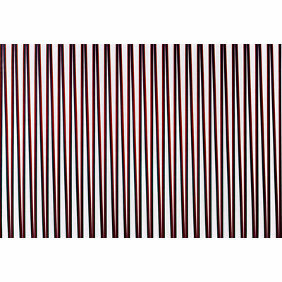 Its influence on European and American art was immense and it was certainly one of the strongest influences on Op Art. 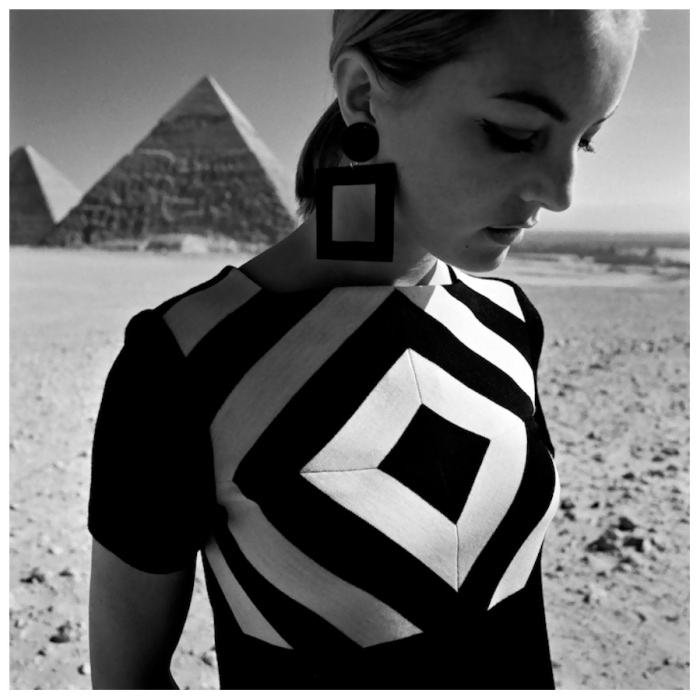 Victor Vasarely, the ‘father’ of Op Art trained in the Budapest Bahaus school. Starting in 1913 with Duchamp’s ‘Bicycle wheel’ and popularised in Russia in the 1920s by artists such as Naum Gabo, Kinetic Art concerned itself with the creation of real or illusory movement. Approaches to the discipline were diverse. 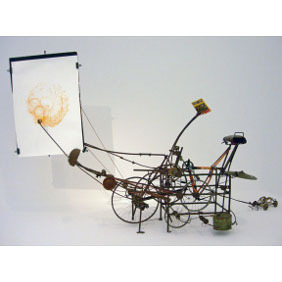 Sculptors such as Jean Tinguely used all sorts of materials, sometimes collecing scrap to construct moving sculptures. For instance, ‘Cyclograveur’ (shown right) invited the viewer to climb on the saddle and pedal to make it move. Another scuplptor, Alexander Calder, eliminated the conventional pedestal and hung his constructions from the ceiling on long rods, so they became known as mobiles. Kinetic Art primarily took the form of sculpture and was at its peak in the 1950s and 1960s, with artists such as Calder and George Rickey leading the way. Clearly sculpture lent itself to movement; the question was how to create movement on a 2D surface. 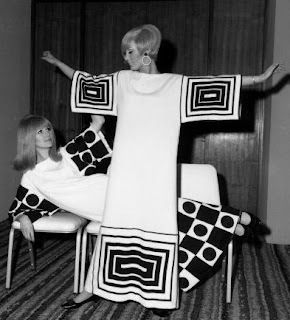 In some respects, Op Art can be thought of as a development from Kinetic Art. 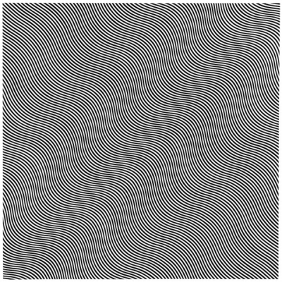 The question posed was how to provide the viewer with an illusion of movement on a static 2D surface. Exploitation of the fallibility of the eye through the use of optical illusion provided Op Artists with the answer. 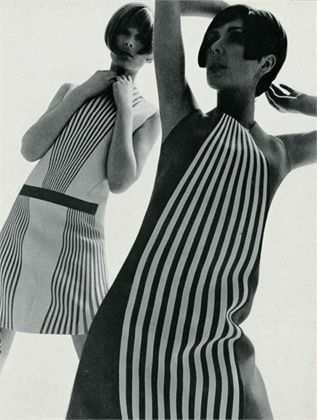 The use of repetition of pattern and line, often in high contrast black and white was one way Op Artists used to create this illusion of movement. The overall optical effect of the technique leads the viewer to see flashing and vibration, or alternatively swelling or warping. Riley’s Untitled Diagonal Curve (shown right) is a good example of this technique, where black and white wavy lines are placed close to one another on the canvas making the surface appear to shimmer and move before the eyes. The separation of art from traditional perspective that began with Cezanne in the late 19th Century allowed for the birth of the Abstract and Expressionist movements amongst others, both important influences on Op Art. Movements such as these de-emphasized (or, in many cases, eliminated altogether) representational subject matter. 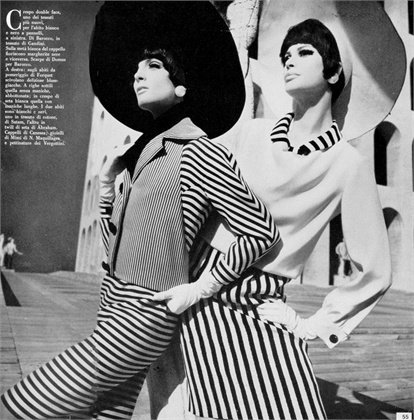 Because of its geometrically-based nature, Op Art is, almost without exception, non-representational. However, despite this non-represenational nature, the Op Artists made extensive use of the traditional perspective techniques originally developed to allow for the accurate representation of the natural world in art, in order to create the feeling of depth and space within their paintings. 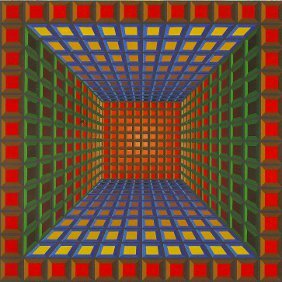 Victor Vasarely‘s Galaxie (shown right) is a classic example of the use of perspective in Op Art with the centralised vanishing point creating the illusion of a receeding frame or lattice set in space. 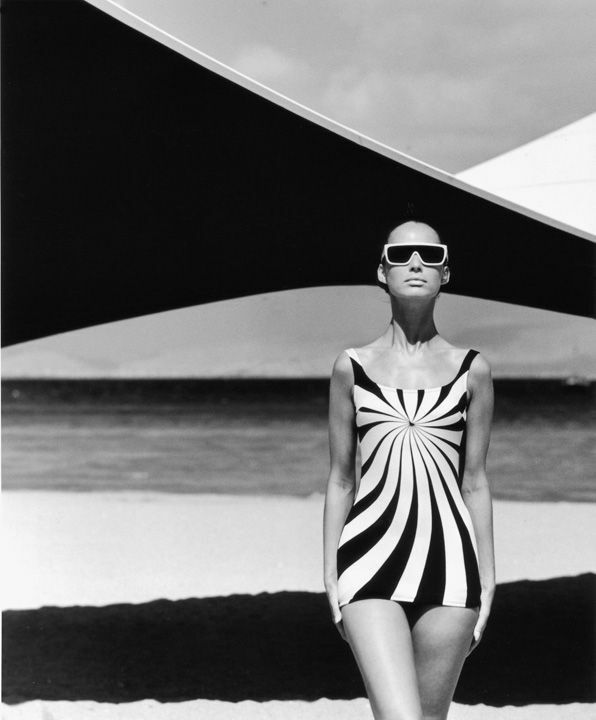 With Op Art came an acute awareness of the work done on the science of colour and colour theory. Colours appear to change depending on their proximity to other colours. For example, a red shape on a white ground appears much lighter than the same red shape on a black ground. Colours opposite each other on the colour wheel when placed next to each other seem to be of different intensity than when placed some distance apart. Those colours in the cool range – blues, purples & greens – are recessive and seem to sink back on the surface whilst the warm colours – red, orange and yellow particularly – are ’emergent’. The manipulation of colours to achieve apparent movement is endless – some colours placed next to neutral greys appear to create new colours – an echo of a colour, an after image, and so on. 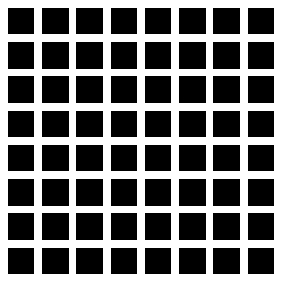 The color relationships in play are known as simultaneous contrast, successive contrast, and reverse contrast (or assimilation). 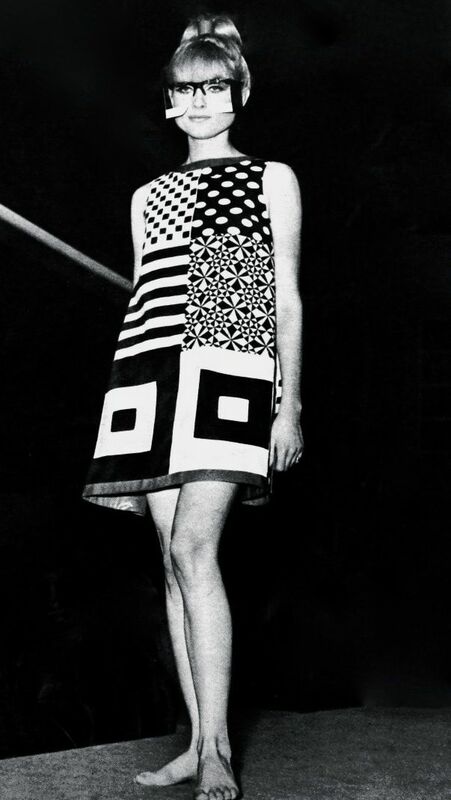 The phrase ‘Op Art’ was coined around the time of the famous ‘Responsive Eye’ exhibition, with ‘Op’ of course referring to optics – the physical and psychological process of vision. Work on the mathematical and scientific basis of perception had been ongoing since the 1800s, with much progress having been made in the 1950s and 1960s leading to a resurgence of interest in the field. The Op Artists, through their study of the science behind how the eye and brain work together to perceive color, light, depth, perspective, size, shape, and motion, were able to put into practice the scientific work around visual perception. 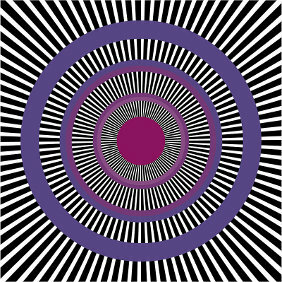 Op Art exploits the functional relationship between the eye’s retina (the organ that ‘sees’ patterns) and the brain (the organ that interprets patterns). Certain visual stimuli can cause confusion between these two organs, resulting in the perception of irrational optical phenomena, something the Op Artists used to full effect. In Perspective part I and part II we saw how linear perspective developed as the dominant force in Western art, only later to be discarded. This in turn led to the cubists experiments with form, Cezanne’s work with colour and the abandonment of representational art entirely in the form of abstraction. From here we looked at the simple geometric shapes of Mondrian and Malevich, the anti-art of the Dadaists, the wild imagination of the Surrealists, the expressive freedom of the Abstract Expressionists and the fascination with popular culture of the Pop Artists. In this section we have looked at the influence of the simple geometry of the Bahaus movement and the movement of the Kinetic Artists. We have also looked at how the scientific basis of perception and colour developed and became better understood. 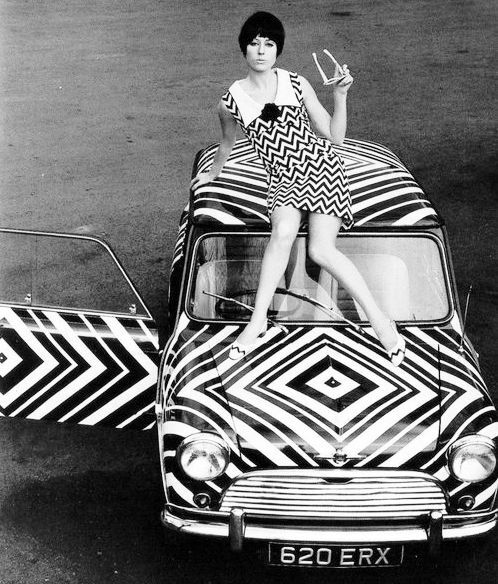 So to answer the question as to what were the influences and origins of Op Art, the answer is hopefully clear… all of the above!